Plus, how to get the most show-stopping botanical decor ever. Even if you haven’t heard of Greenery NYC, you’ve probably seen their work. The New York-based botanic company is renowned for its plant installations—the team has designed spaces for clients like Etsy, the Brooklyn Nets, and even TED Talks. Their latest project? Creating the largest living plant wall in New York City, for Innisfree’s flagship store. Bullene founded the company in 2010 while she was working at the Brooklyn Botanic Garden and discovering that people would ask her for advice on plants. She started taking on some as private clients, and eventually turned her passion into a business. Greenery NYC both designs beautiful installations and helps people bring plants to their homes on their own, via a newly launched online store where people can shop over 30 plant varieties as well as containers handmade by select artists. We spoke to Bullene to get more info about what it takes to create massive landscaping projects—plus, her top tips for incorporating plants at home this fall. Do you have a favorite landscape project you’ve done? I’m very proud of the roof garden we created for the Brooklyn Nets HSS Training Center; it is a beautiful sanctuary and was a complicated project to pull off. I’m also proud of the work we did for Etsy’s corporate headquarters—that was an interior design and installation project that met the requirements of the Living Building Challenge, which is a stringent regenerative design framework. Both of those projects pushed us to become bigger and better at what we do and inspired us to keep working hard to bring more plant life to NYC. What is the main difference in designing for companies vs. designing for private residences? Timing is one big difference. A residential project can go from design to installation in a matter of weeks, with commercial spaces the process may take months or even years depending on how many stakeholders are involved. Residential clients also often have a clear idea of what they want to see in the space. They’ve done research, created Pinterest boards, and are predominantly looking to us to bring their vision to life. With commercial spaces, the client is often relying on us to design the space and present creative concepts that will enliven the space and come up with really creative, new ways of displaying and growing plant life. Your large-scale installations are so impressive, especially the plant walls. Any tips for translating those into homes? Living walls need irrigation and lighting to truly be successful long term. Though it can add to the overall cost, building a system with automated watering and lighting reduces the chances of human error and alleviates the stress of finding someone to water when you travel. 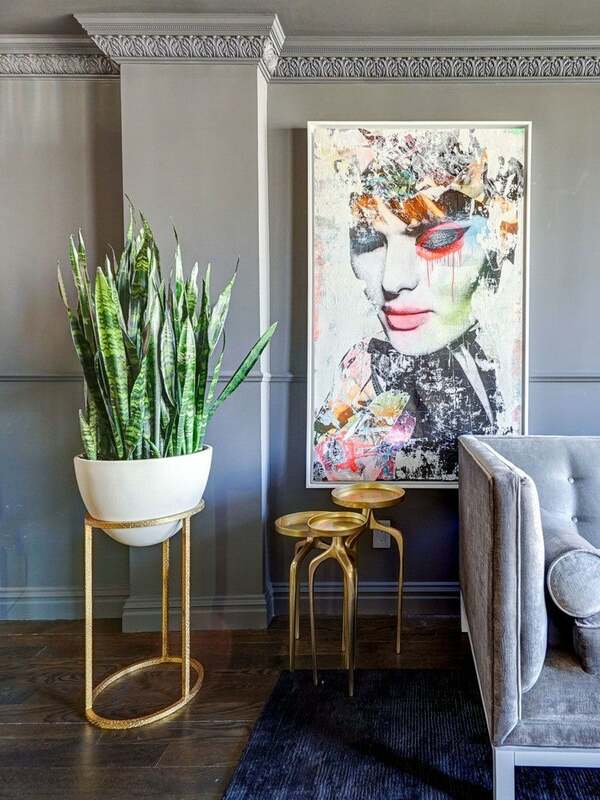 For those who aren’t ready yet to attempt a full plant wall, what’s another way they can incorporate bold greenery into their homes to make a statement? Even on a small scale, placing plants at eye level has a huge impact. When plant life is elevated and visible from multiple lines of sight, it becomes a focal point for the space. We often recommend putting plants on shelves, mounting them to walls, or hanging them from the ceiling to make a bigger statement. Do you have any suggestions for unexpected ways to incorporate plants or flowers into your home decor? Finding interesting vessels can go a long way to elevating the design of plants in any space. A large part of our time when designing spaces is sourcing interesting vessels to showcase the plants. Really interesting pots are hard to find, but Etsy and other maker-sites are a great place to look for something wonderful to highlight your plants. Looking specifically at decorating with plants for the upcoming fall/winter season, is there anything to keep in mind in terms of what works for this season and what doesn’t? Plants are sensitive to the dry heat from radiators so misting your plants in the autumn and winter can help keep humidity levels up and prevent plants from drying too quickly. In general, you want to water less in the winter, but it is important to keep humidity levels up. Spider mites and other indoor plant pests also tend to make an appearance in fall and winter, so be sure to keep some neem oil on had to treat your plants at the first sign of pests. Are there any indoor plants that work particularly well in the chillier months? Pothos is a pretty universally loved plant because its cascading shape is impactful, especially in hanging and wall planters and it’s very easy to care for. It’s forgiving of bouts of drought so not as sensitive to shifts in humidity. Its lush glossy leaves also add a bit of a tropical look which is great in cold weather months. I also love keeping anthuriums indoors in winter as their long-lasting blooms add a pop of much-needed color. Broadly speaking, what are the top things to keep in mind for using plants in your home? Choosing the right plant for the right place in your home is the first and most important step to cultivating happy plants indoors. Knowing your light level can make choosing the plant much easier. Don’t try to put a plant that likes high light in a dark corner–it just won’t work. Know your light level, choose a plant that enjoys those conditions, and you won’t have to work very hard to keep it happy. There are a few ways to measure light, which you can read about on our site. If you have an iPhone check out, Light Meter App; it’s a great tool to determine the light in your space.